You know that feeling that you get when you've worked really long and hard to achieve something, and finally it comes to fruition? Time, care, precision, and sweat are the things that accomplishment are made of. They result in a satisfaction that starts from a tiny ember deep-down inside, but eventually radiates from each and every pore. There's nothing like in the world like it. Oh wait, yes there is. It's called the thrill of instant gratification! That thrill is something that I live for. It's one of the reasons that I went into food and cooking so many years back. The look, the sounds, the scents, the mmmmm's and the oooooh's that escape from people as your food is set in front of them? The murmurs of magnificence and devotion and love. That is a feeling that is unrivaled. Well, if you know me (and if you don't, I swear it's true), you know that I'm a bit of a popsicle, ice pop, and paleta fanatic. I mean, I devote whole (extended) summers to them. They're cold, refreshing, tasty, and they come in endless variations. And for the most part, they're quick to make. The one and only hard part is the waiting. The time that it takes them to go from liquid to frozen delight. I mean, we're looking at 4 hours, at least. Sometimes longer. But now, with the help of my new ZOKU Quick Pop Maker, I can have one in eager hands less than 10 minutes after I've poured the liquid into the molds. It's pretty freakin' amazing...and fun to witness, to boot. It's a little miracle in the quest for instant gratification. How would you like to the one to experience that thrill? Picture a sweltering summer day. The kind of day where the bright heat bends and warps the air before your eyes. And all that you...your kids...the neighbor kids...want is a cold, icy treat in your hand. 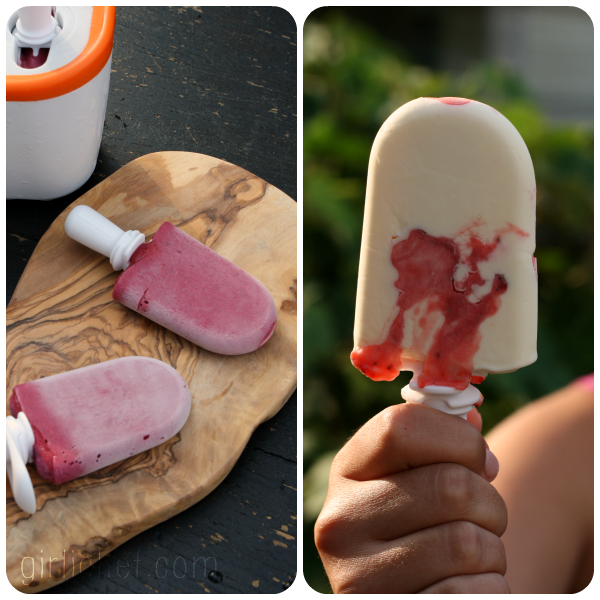 Assuming that you have your ZOKU Quick Pop Maker hanging out in the freezer for just such an emergency, you could walk into the house, and walk back out 15 minutes later with those cold, icy treats in your hand. People will think you're a mirage. Until you've encouraged them to lift those treats to their parched lips; encouraged them to take a lick or a bite. This is where the instant gratification part comes in. Yeah, it's like that. Sounds good, right? Well, my friend Vianney from Sweet Life and I have teamed up with ZOKU today in hopes of bringing that feeling to you. Because so far, this summer's been a hot one - and YOU deserve a little taste of instant gratification! Place everything into the jar of a blender and blend until smooth. Taste, add more honey if you don't think that it's sweet enough. Pour into popsicle molds and freeze for at least 4 hours, adding sticks at the correct time for your molds. 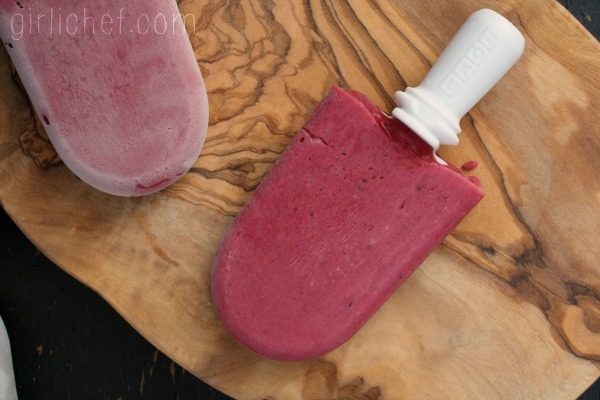 You can use any combination of fruit and berries that you like for these pops. Pictured is strawberry/blackberry. One of my favorite combinations is banana/peach/cranberry. I've also tried kiwi/banana, tropical combo (pineapple/mango/banana), and banana/blueberry. Mix them up and find your favorite! If you're using a ZOKU Quick Pop Maker, simply pour the mixture into the frozen unit as directed, and wait for 7-9 minutes. Remove as directed, and enjoy. So, what is YOUR favorite type of ice pop, popsicle, and/or paleta - and how badly would you like to have one in your hand in less than 10 minutes!? The awesome team at ZOKU is providing TWO of their Quick Pop Makers, one each for my friend Vianney of Sweet Life and myself to give away! How awesome is that? In honor of the Summer of the Popsicle, we are holding our giveaways together...and you have all sorts of chances to win. Simply complete as many of the entry steps as you wish in the rafflecopter form below (it's the same one on both of our sites). Best of luck! 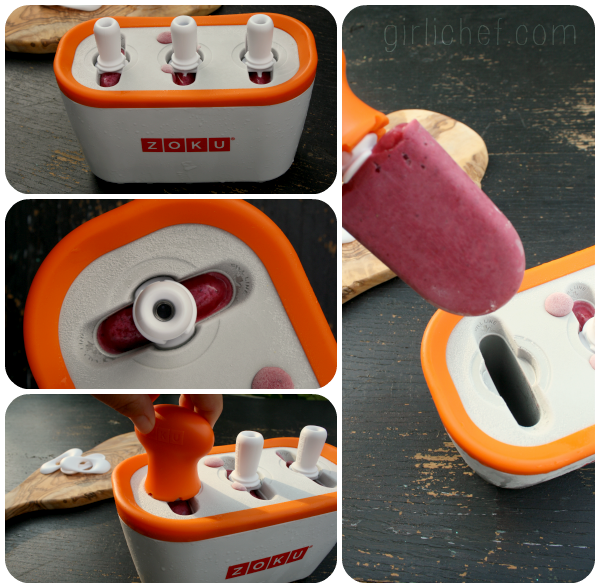 I was provided with (one) free ZOKU Quick Pop Maker to use as I pleased. 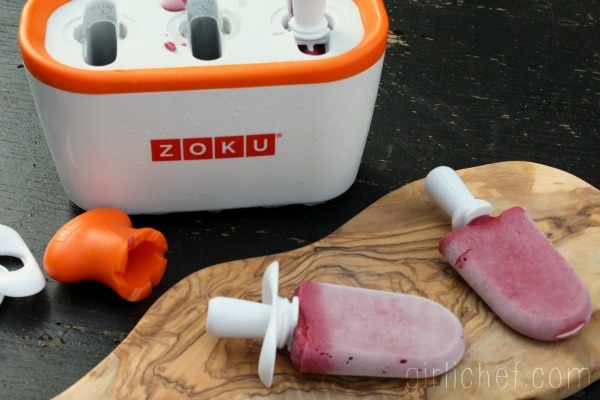 Zoku is also providing the product(s) for the giveaway. I received no compensation for this post, and all thoughts and opinions are 100% my own.